Please note: The digital edition includes John Ashberry's poem “El Dorado” in place of Frank O'Hara's “Chez Jane” which appears only in the print edition. 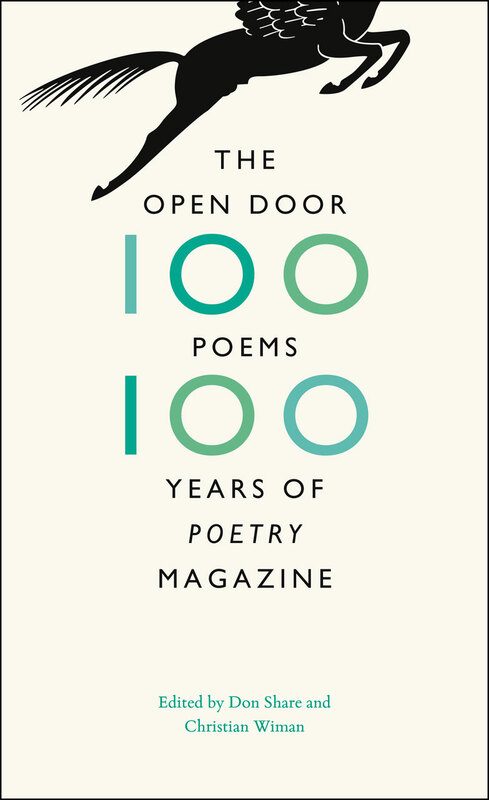 When Harriet Monroe founded Poetry magazine in Chicago in 1912, she began with an image: the Open Door. “May the great poet we are looking for never find it shut, or half-shut, against his ample genius!” For a century, the most important and enduring poets have walked through that door—William Carlos Williams and Wallace Stevens in its first years, Rae Armantrout and Kay Ryan in 2011. And at the same time, Poetry continues to discover the new voices who will be read a century from now. Poetry’s archives are incomparable, and to celebrate the magazine’s centennial, editors Don Share and Christian Wiman combed them to create a new kind of anthology, energized by the self-imposed limitation to one hundred poems. Rather than attempting to be exhaustive or definitive—or even to offer the most familiar works—they have assembled a collection of poems that, in their juxtaposition, echo across a century of poetry. Adrienne Rich appears alongside Charles Bukowski; poems by Isaac Rosenberg and Randall Jarrell on the two world wars flank a devastating Vietnam War poem by the lesser-known George Starbuck; August Kleinzahler’s “The Hereafter” precedes “Prufrock,” casting Eliot’s masterpiece in a new light. Short extracts from Poetry’s letters and criticism punctuate the verse selections, hinting at themes and threads and serving as guides, interlocutors, or dissenting voices. The resulting volume is an anthology like no other, a celebration of idiosyncrasy and invention, a vital monument to an institution that refuses to be static, and, most of all, a book that lovers of poetry will devour, debate, and keep close at hand. Ange Mlinko It Was a Bichon Frisé’s Life . . .
"If readers would like to sample the genius and diversity of American poetry in the last century, there’s no better place to start than The Open Door." "A high-wire anthology of electric resonance. . . . The editors arranged these redefining poems by poets of the pantheon and poets overlooked, underrated, or new in pairings and sequences of thrilling contrapuntal dynamics. Wiman’s opening essay is titled ’Mastery and Mystery,’ and those are, indeed, the forces at work here, inducing readers to marvel anew at the strange impulse to write poetry and the profound effort required to do it well." "With this collection, Share and Wiman want only to promote the art of poetry, something they do exceedingly well. Highly recommended." "A wonderful anthology. . . . In many ways this is a wonderfully democratic anthology—to get in, you don’t have to be famous, you just need to be good."